I made a simple test case with soapUI which adds an username and a message as HTTP header to the service invocation. In a second testcase I will mock this service in soapUI and BPEL will invoke this service and set an extra HTTP header property. In the receive activity of the BPEL process we can use fromProperty to copy the HTTP header property value to the BPEL variable. Do this in the BPEL source mode. Now you can use these variables in BPEL, I will use these vars in the return message. Let's invoke the service from soapUI, we need to set the HTTP header properties with their values. When we want to invoke a reference service and we also want to set some HTTP header properties. On the invoke of the reference service we need to use the toProperty and set the BPEL vars to these HTTP header properties. When we test it again in soapUI we can see the invoke request of the soapUI mockservice, this contains the HTTP headers which we set in the BPEL process. Thanks for sharing this useful information. This would simplify handling http headers. I had a similar usecase in 11.1.1.3, tried several things in bpel, gave up and finally created a proxy service in OSB that can set http headers and let bpel call osb proxy service. Once we upgrade I will modify bpel to directly set http header. Thank you!! Given the features like httpbinding and http header manipualtion from bpel, Do you have an exmaple to invoke Rest based web service call directly from BPEL? this comes close, use the http adapter. Thanks for the pointer, it certainly helps in case of sending XML payload using REST but not for JSON. I know one of your old article talked about using JSON within OSB by adding JSON libraries to OSB server classpath. I was hoping to find an easy and efficient way to deal with REST/JSON directly from within BPEL. maybe you can make your own owsm policy who can do the conversion for you. We are using SOA 11g PS2. How can we achieve this in that.? We need to pass the following custom http headers. Sorry only ps3 and higher. you can ask for a backport. by the way ps2 is not so stable, please upgrade. I have installed SOA Suite 11.1.1.4 and weblogic server 10.1.3.4. I have deployed some composites on to the SOA Server where in i have used human tasks i.e. workflows inside the composites. I am trying to send a request from one of my webapplication but it is throwing me an exception which is described below. Can you please through a light if you have come acrossed it. As it is an urgent which needs to be resolved. We are using SOA 11.1.1.6.0; I tried the steps you have listed above to access the http header variable however BPEL could not read the header variable value. There was no error but header variable was blank; do we need to apply any patch separately? Is there a way to propagate http header (username/password) received from caller in composite/BPEL to the web service called by BPEL - as there was in 10g? is the bpel wired to a service or is there a mediator before the bpel service component. it should work, but to do identity propagation you should use saml. Same problem. I'm trying to send a http redirect with a http binding setting status code 302 and Location http headers. Is that possible ? I'm using 11.1.1.6 and cannot read or write the http header. Can I use this on a http binding interface ? I'm setting http response headers on the reply. it should work with PS5 but don't know if a re-direct will work. Isnt this a limitation with SOA suite ? http://docs.oracle.com/cd/E25054_01/dev.1111/e10224/sca_bindingcomps.htm#autoId3 or it is sorted in PS6 ? Can this be used to pass the 'Authorization' header as well? This would enable us to use this to pass values dynamically for Basic Authentication in BPEL (been looking for such a solution). Don't think it is designed for this , but I think you can retrieve and pass on http headers. We are running oracle soa 11.1.1.7 and I tried to use the similar solution but its not working for me the way it worked for you. can you please confirm if I it will work with 11.1.1.7 ? I didn't test it on PS6 but it should work in 11.1.1.7 else you can log a support call. It doesn't work. 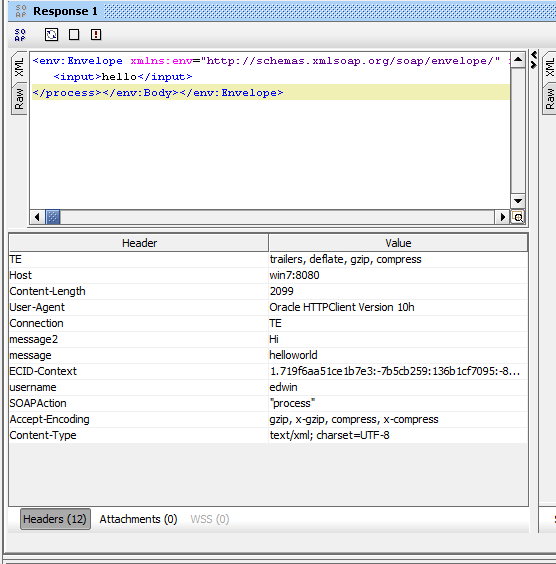 I checked with HTTP Analyzer, Set-Cookie is coming back in HTTP response Header. But In BPEL in get null. Did you got it working? I have raised an SR with Oracle. Will let know here if i get something. It is working for retrieving Request Header, setting Request Header but doesn't work for retrieving Response Header. No help from Oracle yet! It is working for retrieving Request Header. Working for setting Request Header. But doesn't work for retrieving Response Header. That given me a feeling that it could be that i am doing something wrong. Anybody if have tried it.. please share if it worked for you? it is very simple testcase, so I think it is a bug or did you add a mediator in between. I have a similar requirement with Set-Cookie. Was someone able to get this working? I am assigning the value to Autorization(string variable) using Assign activity. In addition, do I need to add bpelx:inputHeaderVariable="Autorization" along with the Custom Header properties? Did you add the patch cause I think it is not support in PS4 , I know PS3 with patch and is added to PS5. Yes Edwin, not only the patch was missing but the SOA 11.1.1.5 is not able to understand toProperties. I changed the toProperties to inputProperty and the Header information was being passed successfully. javax.xml.ws.WebServiceException: javax.xml.soap.SOAPException: javax.xml.soap.SOAPException: Unable to read response: org.xml.sax.SAXParseException: Content is not allowed in prolog. Am I missing something or Is it that the HTTP Bindings adapter can't read the response header. Edwin- Thanks for this post. However I didnt get it working when Bpel is calling a Mediator. I set the Reference properties for Mediator + Invoke for Mediator in Bpel. But Bpel is not sending the Header to Mediator. Not sure what I am missing ? never got this working with BPEL and mediator, only with BPEL. I have a HTTP Binding that does a post with a XML payload as an exposed service. I've been trying to set the mime:content-type of the input and output messages to application/xml but have been unsuccessful so far. Do you know where I set the content-type anywhere in BPEL? I've tried adding a tag in the WSDL file but that doesn't seem to work as well. "unable to access the following endpoint(s): REPLACE_WITH_ACTUAL_URL"
Can you please suggest what can he going wrong here or what more needs to be done? I am using SOA 11.1.1.7 and need to pass a custom HTTP request header to a REST service on POST method. Is there a way for passing the header using BPEL 2.0 ? I am using Jdeveloper 11.1.1.7.0. I need to invoke RESTful service by using HTTP Binding adapter in BPEL using OAuth 2.0 . In order to use this, I need to set Custom HTTP header . I have try add header using soapui and postman and it has worked in both but I can't use it in BPEL. This has been add under the reference section. After I have set this in the BPEL i still get an error and fail to pass the custom HTTP headers. Below is the error. Error Message: Bad response: 401 Unauthorized. Is there any solution or guide for this? I need the solution urgently. I am using Jdeveloper 11.1.1.7.0. I need to invoke RESTful service by using HTTP Binding adapter in BPEL. To invoke this RESTful service I need to use OAuth 2.0 . In order to use this, I need to set Custom header . I have try add header using soapui and postman and it has worked in both but I can't use it in BPEL. can you please share your example along with soapui project? How does BPEL 10.1.3.5 supports similar kind of feature. We have such requirement that from BPEL we need to pass http-header details to ESB (via OHS). ESB could able to get but the OHS will not able to read it.